What does left clicking in the 3D view do? I don't understand what the white circle with the cross is for. I can change its position by left mouse click in the 3D view. Why does it change its position and what it is for? 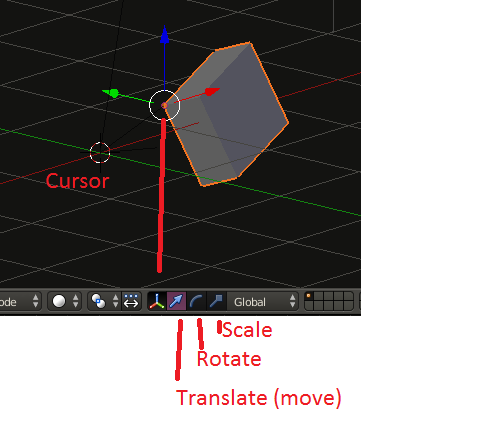 This is the 3D Cursor, and is useful for several things in advanced editing. When you left-click you are setting the position in 3D space for it to be. It works in all modes. If you would like some more details, go to the Blender Manual. is drawn around center of an object and is the center of manipulations like translation, rotation and scale. this not to be confused with the 3D cursor a red/white dashed circle (looks more like a life ring) it is used to indicate position where an object is created e.g. when you add a cube in Object Mode. The 3D cursor can be used in Edit Mode e.g as pivot point and is set by left clicking. I often use the cursor when I need to edit something at a very specific location. Most of the time it's something out of the Shift+S menu. Cursor to selected. use when trying to add and object at a location, select the objectby right clicking on it, Shift+S > cursor to selected. Cursor to center. probably the one I use the most, when you misplace your cursor, and just want it back to the center of the scene; also accomplished by Shift+C but that re-centers your entire screen. Cursor to grid. use so that your cursor is hanging in a more geometric place, not just off in space. Not the answer you're looking for? Browse other questions tagged 3d-view 3d-cursor or ask your own question. How do I select an object in the 3D viewport? What is the number in corner of the 3D view? Why can't I rotate the view?